Squid Girl : saving the world ? Ika-Musume, a squid girl, vows to conquer humanity as revenge for its pollution of the ocean. One of her first actions is to break the wall of a beach house owned by the Aizawa sisters, who force her to work in order to pay for its repair. This is a very enjoyable anime! I didn't know what to expect from this anime but I'm sure gad that I gave it a chance! It's very clever and the jokes and gags are well executed. The characters are cool and you gotta love Squid girl's hapless adventures in the human world! Good show for all ages. Good Fun for Everyone -- de geso! Putting aside the official story (about the "invader from the sea, come to the surface world to punish mankind for abusing the ocean"), there is no overall plot and only stories that serve as springboards for the comedy. There will be many comparisons of this to Keroro Gunsou, another show about invaders who wind up goofing off instead, but there is at least one main difference - this is aimed at a broader audience than just guys (yes, I know KG is beloved by girls too, but that's not who it's specifically written for). It can be said that the title character Ika Musume (literally Squid Girl) is both a loli and a tsundere, not exactly main character material, but it works! And it only works because she never gets her selfish way and often gets humiliated in the process. Here, I'll interject my impression of the OTHER loli/tsundere main character from My Little Sister Can't Be This Cute (aka Oreimo). This is a show which, in my opinion doesn't work because the main character is sour and gets away with everything. That's not comedy to me. In this show, whatever silly nonsense Squiddie comes up with in her quest to "conquer mankind", or just be irritating, is dealt with in a variety of ways by a variety of supporting characters. It's this interaction which defines the other characters; when Squiddie is spoiled she is dealt with by Eiko (the straight-man), when she's being dangerous, she is dealt with by Chizuru (the unassuming powerful elder-sister to Eiko) and when she needs to be reminded to be kind there's the enthusiastic little brother and competitive lifeguard. The animation is done in a cutesy-moe type art, but the actual flow goes from average to cheaply static. The designs are great and executed cleanly, giving the show a brightness that points out this show is for all ages. A good example of the difference is comparing this to A Certain Magical Index (whose main character bears more than a passing resemblence to Squiddie). In Index, the lines are thinner and the coloring muted creating a visual more appealling to an older audience, despite having very similar designs to Squid Girl. The music (specifically the intro and outro) will either grab you or repell you. The intro is loud, bouncy music and the outro is a slower melancholic tune. Personally, I think these choices perfectly match the mood of this show; fun with the occasional interesting statement. While the show is split up into three segments (vignettes), there is no common theme linking them. The emphasis on comedy before all else may not be for everyone's tastes, but it's pretty inoffensive so far while being slightly random. It will be interesting to see where the writers take this in the future. Squid Girl is totally hilarious. I have watched this anime on a spur of the moment. I saw the previews and felt that I would be interested in. All the characters are interesting and entertaining. My favorite is episode 5 where Sanae has a dream and Squid Girl is little. I have actually watched that one several times. I am looking into actually buying this for my collection. To be honest, she is trying to annihilating the human race but she has not adept in accomplishing that, she is however adept in doing the exact opposite which is why no one and I do mean no one pays her very much heed. Well accept for Nagisa who thinks she is really able to do it. She is so smart but lacking in common sense. 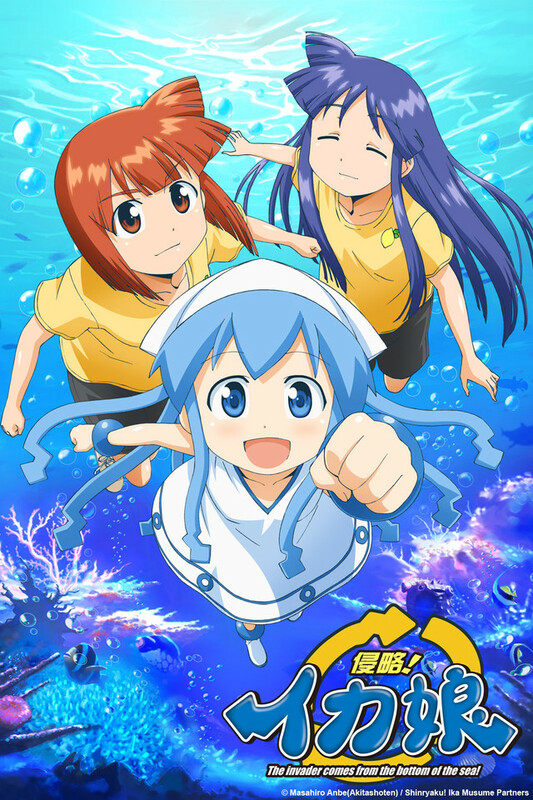 MY REVIEW OF SQUID GIRL! Shinryaku! Ika Musume is one of the most joyous, hilarious anime out there. There is a lot of humor involved, and the characters are well developed, and creative. As well as the background music, it was fantastic! especially the last episode where ( SPOILER) Ika musume goes back to the ocean, and takes things as miss-communication. The touching music in the background (http://www.youtube.com/watch?v=hOUDv_yvpg8) is simply beautiful! I have had many laughs with this anime! The storyline is alright, though, there is an overall story, but it doesn't really follow through with Ika musume, like some anime, where the character is looked after day after day, Shinryaku! Ika musume is told with 3 different stories per episode, usually consisting of a simple plot at a time, sort of like nichijou, but less random. The animation didn't bother when i watched it, the style suits the anime very well, with a sort of comical simple feel to it. I'm sure everybody will enjoy this anime as much as i did!